When I arrived at the airport, after having arranged a pickup, a hotel employee informed me that the hotel was overbooked and that we'd have to stay in a different hotel. The place they took us to had hard mattresses, smelled like mildew, and was in a terrible location. I feel we were scammed - promised one hotel and given another. Very disappointing as I would have just booked a cheaper hotel if I wanted to stay in a less relaxing room. Spent three days there. Free Airport transfer. Great staff took care of everything we needed including organising Tuktuk driver and guide. If you really want to understand and experience Angkor's temples, invest the extra money ($40 per day) for the guide. Hotel is very close to the entrance gate. Excellent restaurants nearby. Remote place, big rooms,, absolutely recommendable. My stay was excellent. The room was terrific: large, clean, quiet, and extremely affordable. Its a tiny bit off the beaten path, but still in the heart of the city - the road just isn't paved, but still exceptional deal and I would definitely stay there again. Plus, the staff is superb and the included breakfast's were great too! Room was lovely, a few issues with water pressure and poor fridge, but we are in Cambodia. very clean. Food, breakfast was slow and very ordinary, under cooked eggs, stale bread, . Service, was tricky, due to our lack of Cambodian, and minimal English, spoken by staff. Really cute place close to temples. Staff is ultra helpfull and can book anything for you. Bike available to go to the temples ( around 15 min, good biking). A bit hard to find though as very small backyard unpaved street. 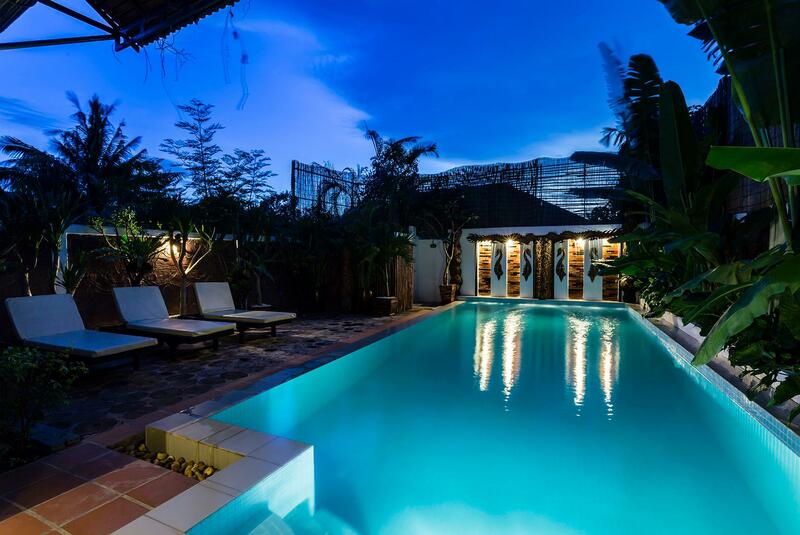 Owner is very nice, and all confort is provided in great big room (super big bath), small pool, chill veranda. Only minus is the slight remote from the city center, but easy with tuk tuk. The setting of this hotel is perfect for romantic getaways. Cooling atmosphere throughout the whole day due to the location and choice of flooring. Service was excellent. The furnishing from the exterior to the interior of the rooms were designed to give their guests a welcoming feel. my friend was staying in this hotel and I have booked it for her. She said she absolutely loved it and didn't want to leave. The owners must be very nice and caring. Rooms are beautifully decorated (I saw some photos my friend took and it was indeed very nice!) and makes the stay feel like home. Easy to take a tuktuk to te city center (5min) and very good location to Angkor wat. My husband and I greatly appreciated how the staff members picked us up from the airport and always greeted us at the door, either with something to drink or a refreshing towel. The manager was very friendly. The rooms were very large. We had a wonderful time relaxing at the beautiful pool, traveling a short distance by tuk tuk to the Old Markets, and having a large breakfast in the morning. The staff is what makes this hotel special. We certainly hope to stay at this hotel in the future. I dont now how any owner can tell is a 4 star hotel-No light and asphalt for go from the street to the hotel-Writing in the hotel description 24 room service but not even have a menu or a kitchen what is open-Ok the room is big but to tell is 4 star suite room is to much-For this money you can find many better place even in the high season.Maybe can tell is a 2 star plus hotel will be ok but to write **** is far away from this standard. The location was extremely hard to find. Better to get owner to pick you up from your location. However, the room was superb! The breakfast was great too. Three rooms only makes this experience a very personal one. Like you are invited to somebody's home. 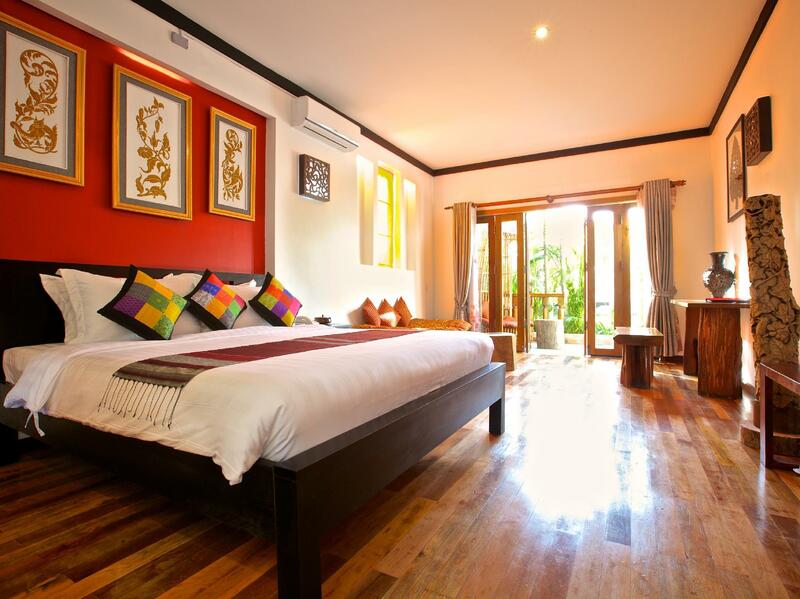 A large room with ample sitting space inside and outside makes this the best experience ever in Siem Reap. Ran gave us advice where and how to go, including the local scene. The last night he and our regular tuk-tuk driver took us to the area where the Cambodians relax, eat and drink. A great experience which we will not forget. Good discussions with Ran gave us much more insights in the living and culture of the Cambodian people. In short: you have to come here!! Friendly and Helpful Hotel owner and Staff . Comfortable large rooms and Well Furnished . We very much enjoyed the swimming pool and the interior design of the rooms (done by local artist) was very unique and sophisticated. Since there are only 3 rooms, it has a quiet and low key environment. The staff helped us to schedule our trips and booked our transportations. Overall very satisfied.